Demonstrators gathered in over 30 U.S. cities last Wednesday as part of a “Jewish Day of Resistance” against President-elect Donald Trump and his appointment of Stephen Bannon as chief strategist and senior counselor. 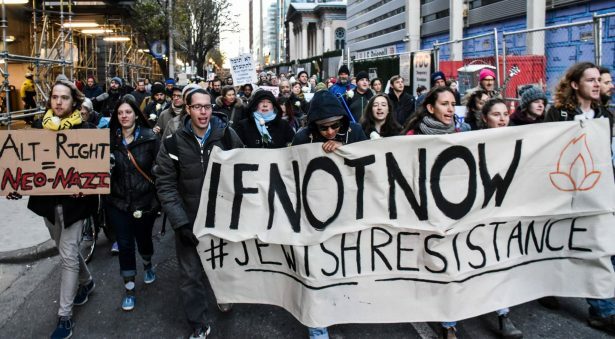 The group responsible for organizing the day’s events is IfNotNow, an organization of Jewish youth concerned with the rise of anti-Semitism, Islamophobia and xenophobia characterized by the rhetoric of Trump and his appointees. In New York City, protesters lined up on the Brooklyn Bridge and outside the midtown office of Birthright Israel. In Washington, D.C., protesters already entered the lobby of the Republican Jewish Coalition, or RJC, holding signs to “Draw the Line” against policies that threaten to tear the country apart and calling for the coalition to stand against Bannon. The group was “violently forced” from the building by RJC private security, according to IfNotNow organizer Ethan Miller. The incident was recorded on Facebook Live. Opposition to the occupation was the founding objective of IfNotNow, which formed in reaction to the 2014 Israeli offensive on Gaza. IfNotNow aims to bridge political divides by focusing first on dismantling the occupation. “Other organizations are focusing on policy, but we think all solutions will be stronger once the occupation has ended,” Miller said. The occupation is “a moral crisis” in the Jewish community, Miller continued, adding that Jewish leaders must recognize the “freedom and dignity” of the Palestinian people as integral to their community’s future. IfNotNow, which has seven official chapters across the United States, has seen a surge in first-time activists since the election and has provided advice, support and two-day training sessions to meet the growing interest. They also work closely with fellow grassroots movements like the migrant justice group Cosecha, while maintaining a uniquely Jewish framework, by organizing actions around Jewish holidays and traditions, and singing Hebrew songs.